Born in 1969 in Roccavione (Cuneo), Italy, Marco Cordero graduated in Sculpture at the Albertina Academy of Fine Arts in Torino, city where he continues to live and work. His work establishes a genealogic relationship to matter, undertaking a movement in which, from the library as a collective heritage, becomes the germ of sculptures that hold a material “reminiscence” value. The intervention on the written text in which he digs, profiles enigmatic shapes and forms, and sets a space in which the matter is thought as memory. The book, though cut in a creative intention, remains idolized as an aesthetical, historical, cultural and divinatory object. This creative and aggressive gesture represents thus the nuclear element that makes explicit and overcomes the first meaning by opening a latent and potential semantic field. The hand of the artist gives way to the drawing that emerges from the stacked pages, showing the deficiency or inadequacy of writing to communicate properly, turning into an indecipherable text. 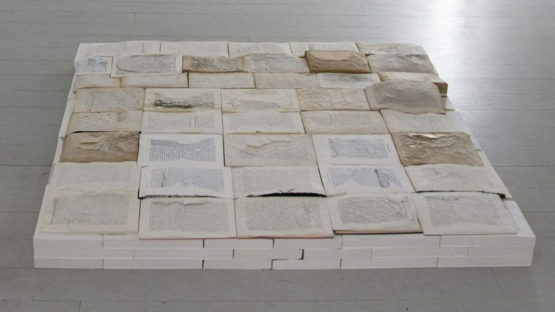 Words stay readable and emerges from literary hidden references, simulating a horizon line; an excavated group of books brings to light a mountain landscape from which tracks of earth or charcoal traces, as a sort of memory of their future. Dialectic process between the materiality of heritage and his conceptual projection, Cordero undertakes then a hermeneutic of substance. He re-interprets and transforms this legacy in a renewed language, seizes the texts and their opened possibilities to perform an unveiling and concealing game, that enhances an archaeology of subject who confronts the matter.